Our authentic passion mission intention is for everyone to leave Ubud Yoga Centre feeling light, confident and inspired. Ubud Yoga Centre is a contemporary two-tiered complex building created with several functions in mind: Yoga Centre, Paiste Gong Centre, Kids Centre, Gift Shop, and a Cafe. The exterior was designed by Popo Danes, one of Bali’s most prominent international award-winning architects with a commitment and passion for the environment. Danes is passionate about harmony between culture and art. 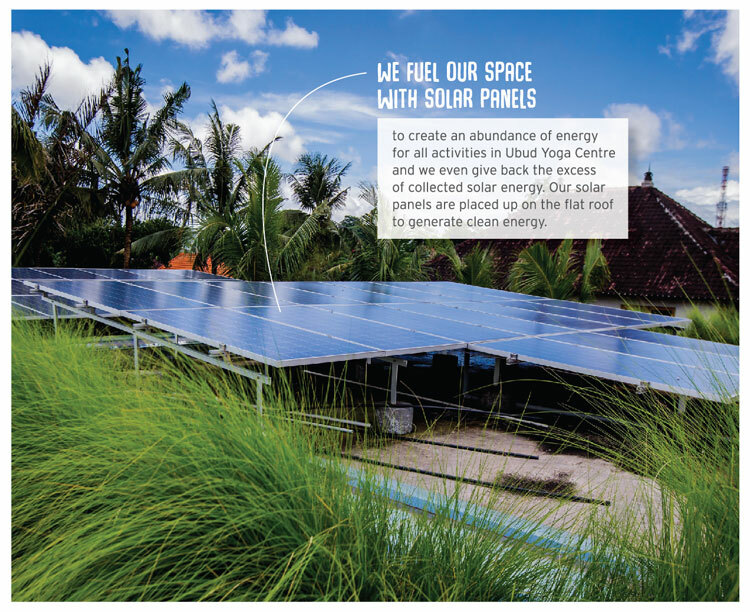 We fuel our space with solar panels to create abundance of energy for all activities in Ubud Yoga Centre and we even give back the excess of collected solar energy. Our solar panels are placed up on the flat roof to generate clean energy. With exterior by him and interior by Mony, we envisioned a modern space, combining cement with glass blocks to create a green building that infused the beauty of jungle into your yoga practice and uplift you. 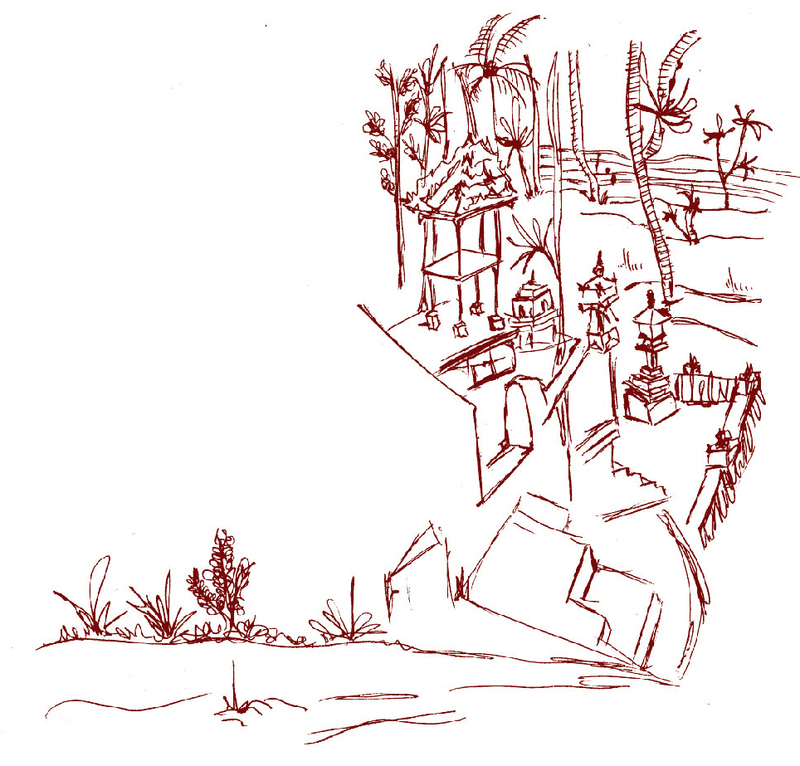 We presents to Ubud a phenomenal building, a rare mix of urban and peaceful natural serenity. Popo Danes designs his building carefully to create the structure, promoting harmony between human habitation and nature, preserving heritage and culture, to help the spirit grow in relation to both society and nature. We at Ubud Yoga Centre realise that Yoga is the key to leading an inspired, healthy & happy life ~ Yoga is life! So we believe yoga should be accessible for all. We choose the look and certain materials for the building keeping in mind the love for Bali and its sustainability. Thus using glass blocks in the front facet of the building to filter noise and keep te arrays of natural light inside. Glass blocks are energy efficient and environtmentally friendly as windows. It’s a green building material produced proudly in Indonesia. 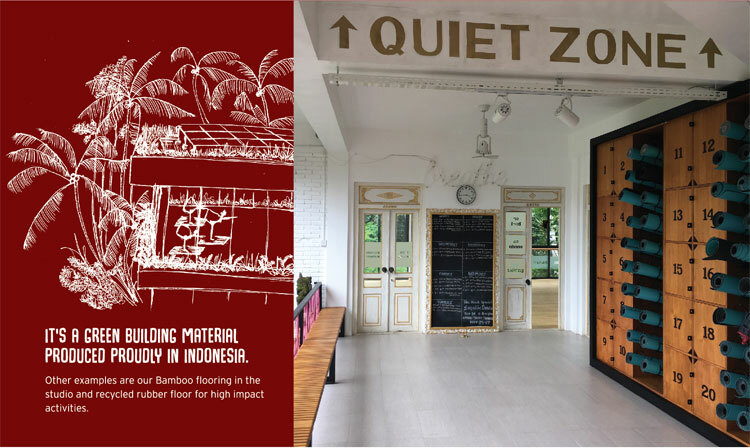 Another examples is our Bamboo flooring in the studio and recycled rubber floor for high impact activities.